Engage with your users or your industry, by letting them upload and share their own videos under your brand. 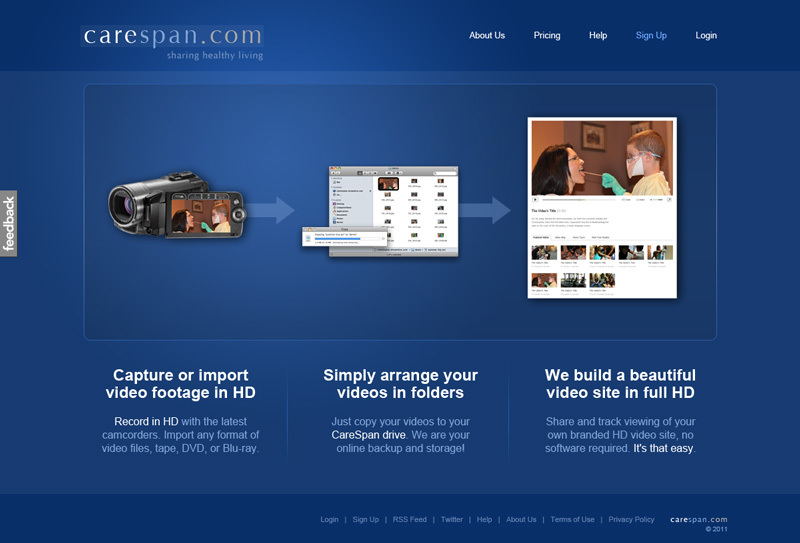 Give each user or company their own video site for HTML5 video for Windows, Mac, iPad, and iPhone. 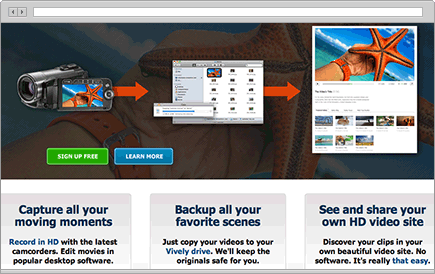 Online backup for HD video files, with automatic transcoding. Backup your videos as easily as using a local hard drive. Just drag them from your camera or USB drive and drop them in the folder. 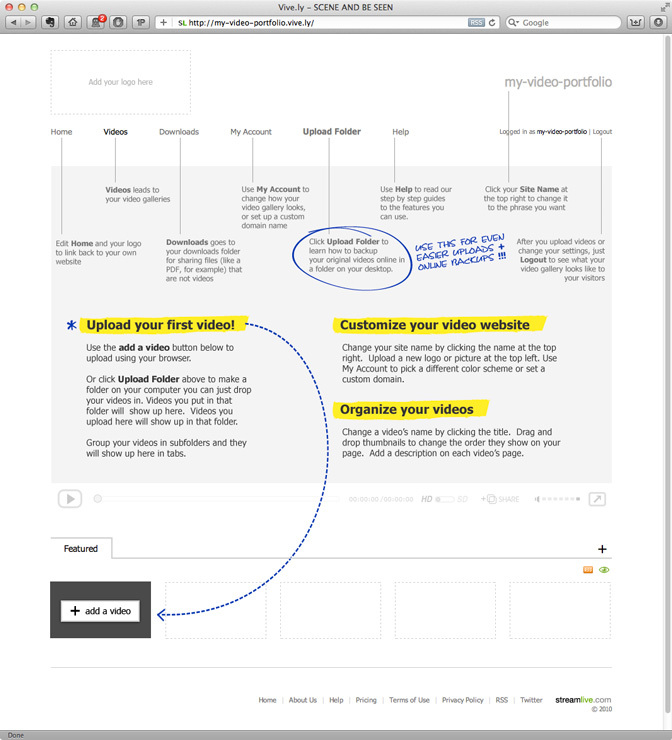 We build your video sharing site to match. We don't limit you to 5 or even 15 minute clips. Upload a two hour training video, or a conference session shot in HD, no problem. We convert the uploaded video into formats for Flash, Silverlight, and HTML5, including the new Google WebM format. Viewers can watch from PCs, Macs, iPhone and Android, or even from Roku and TiVo. Your folders show you your originals. We keep track of all the Internet video formats. Rename your original, we rename all the copies. A video's owner can access the originals at any time, and download the Internet formats too if they want. Beautiful HD video galleries generated from video storage. We provide a "video for everyone" player stack supporting Flash, Silverlight, and HTML5 video playback. Fans of open video formats can give WebM and Ogg priority for Firefox or Opera, while still supporting iPhone and iPad with H.264. 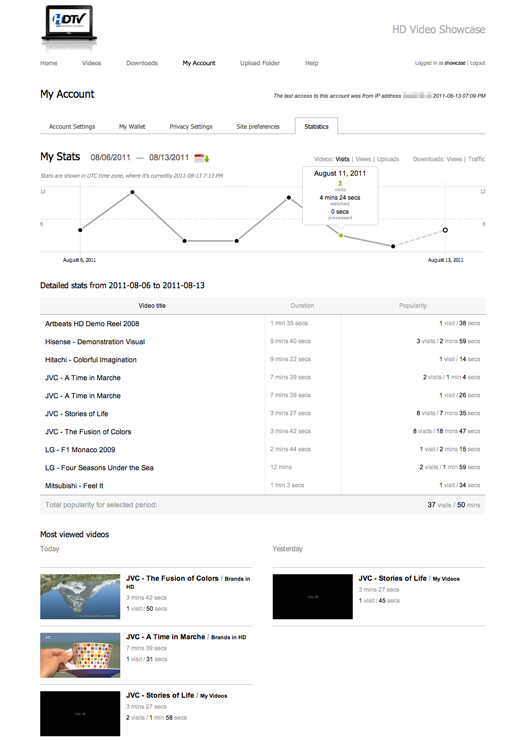 The online video platform publishes to PCs and Macs, as well as iPad, iPhone, Android phones, and Android tablets. It also offers custom channels to TiVo, Roku, and other Internet-capable set top boxes or TV sets. Easily build video sites that look and work like Hulu™, just by dropping originals into sub-folders. Each folder generates a tab, with custom thumbnails for the clips, and RSS feeds that users can subscribe to to follow the latest videos. See at a glance which videos are popular and how much time visitors are spending watching them. Custom logos, custom domains, custom themes – yours and theirs. Publish medical training videos, or marketing videos about pharmaceuticals or procedures, with no risk of ads or "see also" suggestions from competing brands. Realtors™ can post real estate videos that comply with MLS™ branding rules. Religious, education, and non-profit organizations can create safe communities for their members and even share video privately with three levels of privacy. Video camera manufacturers can give users their own online storage and video publishing. 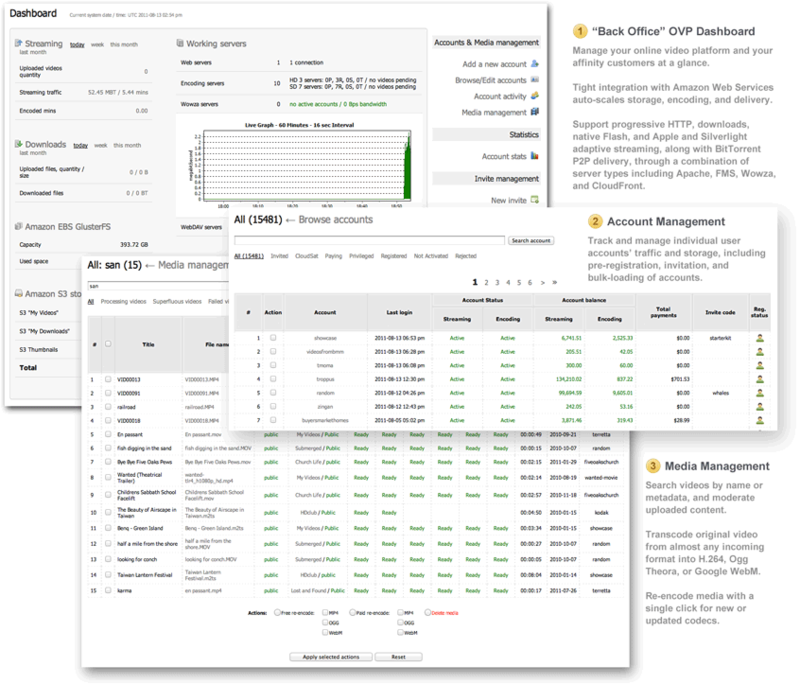 Storage manufacturers can offer synchronized online backup and video sharing that doesn't rely on a consumer's home connection. By default, video publishers get their own URL on your branded domain, like "username.yourbrand.com", but you can also allow them to bring their own custom domains, like "videos.username.com". Use the invitation code “GetVively” to upload and share some original HD videos, then get in touch with us. GetVively is the easiest way to license your own Hulu™-style video publishing platform you can offer to your customers or your industry. If you just want to publish your own video, sign up at Vive.ly, or for customization, try the Advection.NET video delivery network. © 2013 Vively™. All rights reserved. 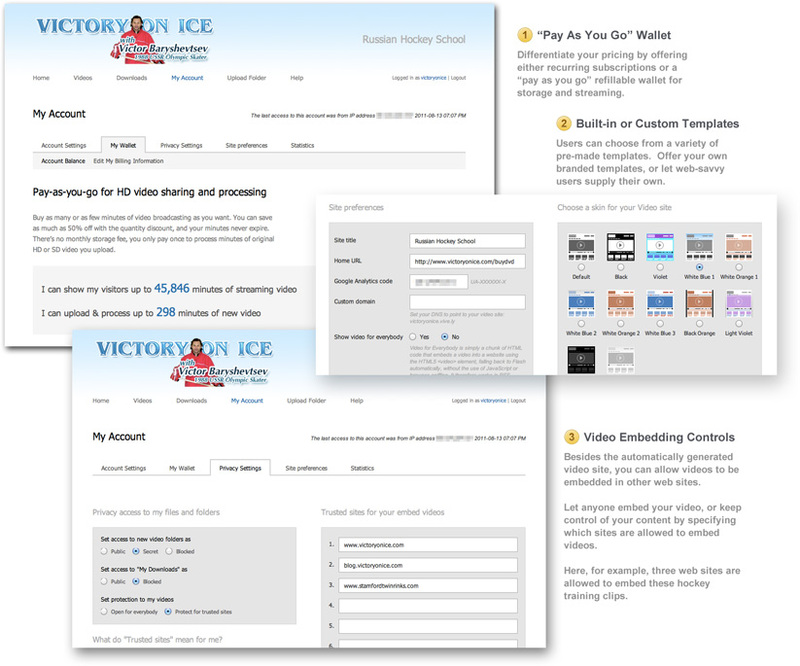 I'd like to know more about licensing or reselling the Vively online video platform to ___________. You can reach me by email at _____________, or by telephone at ______________. I'm available between ____ and ____, in __________ time.